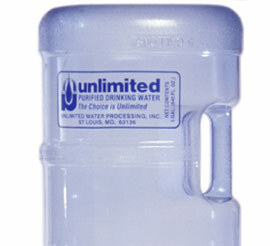 Our refillable 5-gallon returnable bottles provides an unlimited water supply in a cooler. We deliver our 5-gallon bottles right to your office or home. This solution is quite popular in offices, schools, construction and retail environments. Our hot and cold coolers come in a variety of styles. Sturdy construction and low maintenance make these coolers ideal in the home or office settings. Delivery and set up is provided by Unlimited Water Processing.